Scotland brought Japan back down to earth by beating the Asian side 45-10 at Kingsholm stadium in Gloucester and get their Rugby World Cup off to a flying start. The match was Scotland’s first in the Rugby World Cup and just four days after the Japanese beat South Africa’s Springboks 34-32 in Brighton. Scotland centre Mark Bennett was the star of the match as he scored two tries while his captain Greig Laidlaw kicked 20 points. Japan’s heroics beating South Africa left them exhausted and after a bright start with a brilliant Amanaki Mafi try, they just could not keep up Scotland. Leading 12-7 at half-time, Scotland took complete control after the break. Two tries by Bennett one each from flanker John Hardie, Tommy Seymour and Finn Russell on his 23rd birthday crushed the spirited Japanese. 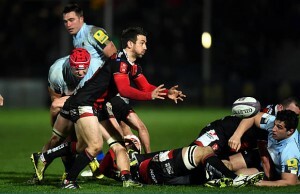 Scottish skipper gave a clinical display of kicking on his Gloucester home ground, packed with 14,354 people for the occasion. “We hung in there and competed well for an hour but we just ran out of energy,” said Japan captain Michael Leitch. Laidlaw paid tribute to the Asian champions. “They gave us a good workout for our first game and it took time for us to get into our stride,” said. 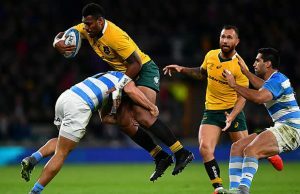 The Scots did not make the same error as Spingboks skipper Jean de Villiers as Laidlaw opted to go for goal with their first penalty rather than kick for touch. The Scottish captain slotted over for a 3-0 lead after two minutes and soon added a second. Japan stayed true to their attacking instinct. Star fullback Ayumu Goromaru kicked right into the corner from a penalty and from the ensuing throw in No 8 Amanaki Mafi drove over for a brilliant try to get Japan back into the game. Goromaru — scorer of 24 points against the Spingboks — added the conversion for 7-6 but Laidlaw added two further penalties to take it out to 12-7. Japan repeatedly got on the wrong side of Irish referee John Lacey. Lacey’s patience ran out at persistent infringements and flashed a yellow card in the 23rd minute at Japanese wing Kotaro Matsushima for ripping the ball from Scottish opposite number Sean Lamont after tackling him. Laidlaw missed the resulting penalty and despite being one man down the Japanese kept the Scots largely inside their own half. They might even have reduced the deficit. Goromaru sent a penalty just wide of a post and Mafi looked to be due his second try but the 25-year-old Tongan born back row forward was adjudged to have taken the ball from a forward pass. Maft then tried a novel way of going over the tryline by leaping NFL style over the massed bodies but came up short. Goromaru produced a heroic tackle on the stroke of half time to stop Tommy Seymour scoring a near certain try. The Japanese came bursting out of the blocks in the second-half Mafi bullocking his way deep into the Scots’ 22 before being brought to ground and had to be stretchered off with a leg injury. 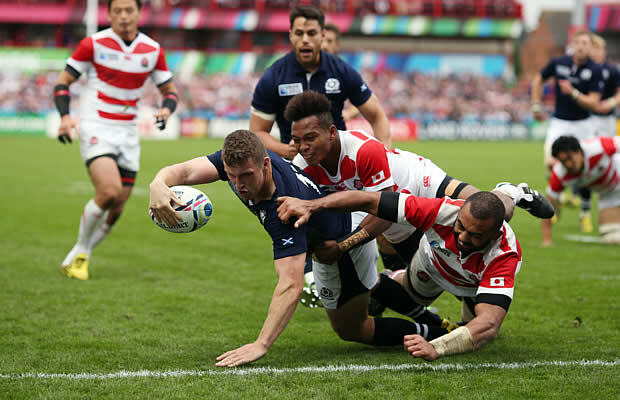 Goromaru kicked a penalty — the Scots having gone offside — to move the Japanese to within two of the Scots at 12-10. However, Hardie stretched the lead as fed by Laidlaw he went over after a rare fluent backline movement which saw Matt Scott held up just short of the line. It was Scotland’s first World Cup try since their first match of the 2011 tournament against Romania. Goromaru missed a chance to reduce the deficit, his penalty coming back off the post. It proved a turning point as a brilliant piercing run by fullback Stuart Hogg resulted in centre Mark Bennett going in under the posts — Laidlaw adding the conversion for 24-10. It was game over just after the hour mark as Seymour this time made no mistake, intercepting a Japanese pass inside the Scots 22 and just had the legs to evade a couple of Japanese defenders to touch down — Laidlaw converted for 31-10. Somewhat undeservedly from a Japanese point of view the game turned into a rout as their weary bodies failed to stop Bennett going over for his second try — Laidlaw added the conversion for 38-10. Replacements: Takeshi Kizu, Masataka Mikami, Kensuke Hatakeyama, Shinya Makabe, Shoji Ito, Hendrik Tui, Atsushi Hiwasa, Karne Hesketh.